Unbeaten Chris Algieri (20-0, 8 KOs) is hoping to beat the old lion WBO welterweight champion Manny Pacquiao (56-5-2, 38 KOs) next month in their fight on November 22nd and take his place at the top of the boxing world. Pacquiao has showed signs of aging in his recent fights, and the taller and younger Algieri could be the guy to knock the soon to be 36-year-old Pacquiao of his throne. 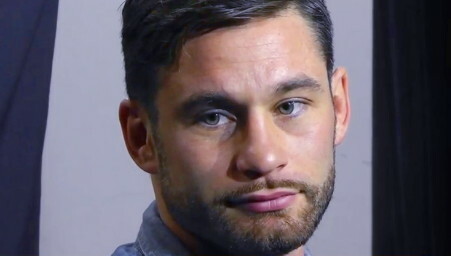 Algieri would still need to beat Pacquiao in a likely rematch before he could move on to face guys like Floyd Mayweather Jr, Kell Brook, Amir Khan and Keith Thurman. Financially, a victory over Pacquiao will set Algieri up for life because it would enable him to get a bigger purse split in a rematch against Pacquiao. “I’m a confident guy to begin with. I know I put in the hard work, you know, so I feel that much more confident because the work is done,” Algieri said to Fighthype.com. “This is a real fight. It’s the old lion versus the young lion. I want to be where he’s at. I’m going to have to show another gear…it’s the beginning of my legacy,” Algieri said. Algieri says he’s going to use his jab frequently to control Pacquiao, and keep him from getting close enough to land his bigger shots. Whether Algieri will be able to do that is the big question. Pacquiao’s trainer Freddie Roach has him training with taller sparring partners with a long reach and excellent mobility to get him used to what he’ll be facing on 11/22. Roach believes the 5’6” Pacquiao will be able to cut off the ring without any problems in this fight. Of course, Pacquiao didn’t look so great in trying to cut off the ring last April in his second fight against Tim Bradley when he had to deal a few brief moments of movement. Bradley stood in front of Pacquiao for the most part in that fight, making it easy for him. But I didn’t see any real changes in Pacquiao’s game that would suggest that he’s gotten better at cutting off the ring against his mobile opponents.